I’ve been on this kick to bake bread daily (which means it happens about 3-4 times a week, because anything I try to do daily usually only happens 3-4 times a week), so I’ve been going through my bread cookbooks. This recipe comes out of Beth Hensperger’s Bread for All Seasons, which I recently gave to my sister, and I remembered how much I love this book. I was so happy to find a recipe that uses zucchini but isn’t sweet, just to give me another option for all the zucchini that is starting to appear. 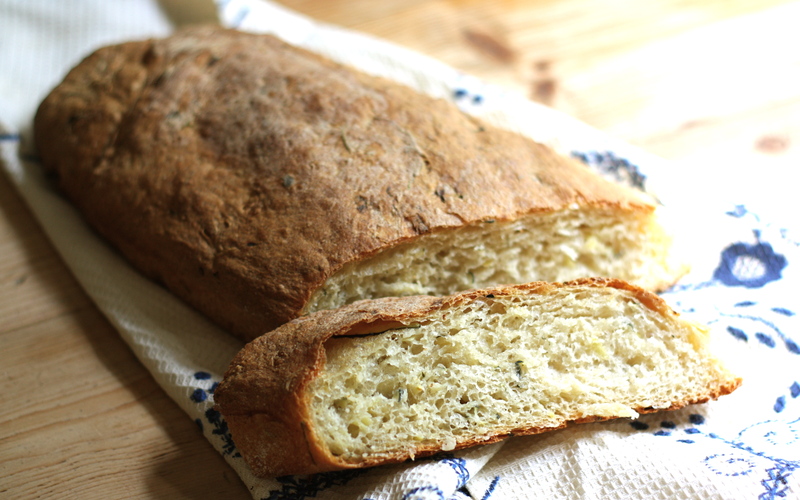 This loaf is great to accompany salad or soup, or we had it with a homemade boursin (goat cheese with a little minced garlic, chopped basil, parsley, and rosemary), and an array of fresh fruits and vegetables for dinner. Perfect summer meal. Note that one batch will make two long loaves. In a standing mixer, sprinkle the yeast, sugar and 1 1/4 cups of the flour over the warm water. Beat well until smooth and creamy, about 1 minute. Cover loosely with plastic wrap and let rise at room temperature until bubbly, about 1 hour. Meanwhile, coarsely grate the zucchini to make 2 packed cups and drain in a colander set over a plate (with a little sprinkle of salt) for 30-60 minutes. Add 1/2 c. of the remaining flour, oil, salt, and grated squash, and beat until smooth, about 2 minutes. Add the remaining flour, 1/2 c. at a time, until a soft, sticky dough is formed that just clears the sides of the bowl. Turn out onto a lightly floured work surface and knead vigorously until smooth and springy, about 2 minutes, adding 1 T. flour at a time, if necessary. The dough will be soft and smooth. Place in a greased deep container, turn once to coat the top, and cover with plastic wrap. Let rise until doubled in bulk, 1 1/2 to 2 hours. Turn the dough onto the work surface and divide into 2 equal portions. Form each portion into a 10-inch cylindrical log with tapered ends, dusting the entire round of dough with a bit of flour, and place seam side down on a greased or parchment-lined baking sheet. Cover loosely with plastic wrap and let rise at room temperature, about 45 minutes. Meanwhile, preheat the oven to 425 degrees. With kitchen shears, snip the top of each loaf on the diagonal 3 or 4 times. Brush the top of the loaf with olive oil, if desired. Place the loaves in the center of the preheated oven and bake 40-45 minutes or until crusty, brown, and sound hollow when tapped. Remove to a rack to cool completely.